Flexibility, performance, and value. 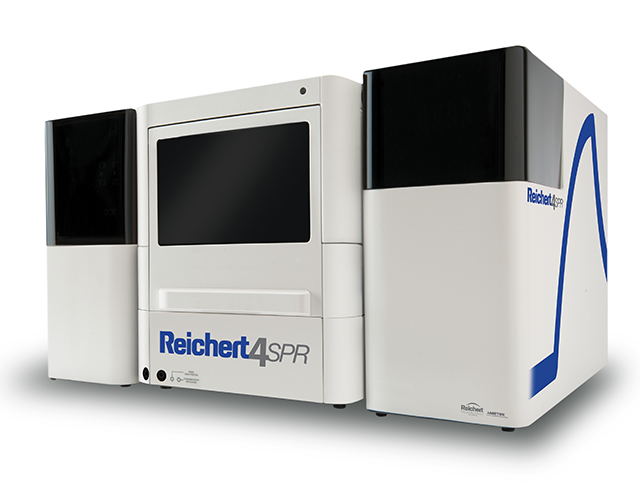 These are the key features of the newly released 4-channel Reichert4SPR Surface Plasmon Resonance system from Reichert Technologies, now available from XanTec bioanalytics. Featuring the latest advancements in optics, imaging, electronics and software, the SPR4 builds upon over 15 years of experience in SPR system development. The Reichert4SPR allows use of up to 4 individual channels simultaneously. Users can analyse 3 experiments and 1 reference at the same time, allowing multiple factors to be assessed in a single run. Alternatively, users can perform 2 experiments with separate reference channels, either simultaneously or at separate times. Each of these approaches allows your group to increase their speed and efficiency, getting much-needed results faster. At the end of the day, it's all about the data, and this is where the Reichert4SPR really delivers. Extremely high sensitivity allows for minimised sample requirements, concentration and equilibrium constants can be determined down to the picomolar. Coupled to very low baseline noise (+/- 0.05 μRIU RMS) and minimal baseline drift (< 0.01 µRIU/min), this means that your data is clean and free of complicating factors. Sensitivity is boosted by features such as a built-in degasser and easy solvent switching. The software has also been further improved. New users will enjoy drag-and-drop protocol development and wizards to explain the processes from instrument setup to complex analysis. Integrated data analysis allows easy data comparison, fitting and reporting, even while the experiment is occurring. First, a typical antibody-antigen experiment, showing Human Serum Albumin binding to its respective monoclonal antibody. Fitting results for six different HSA concentrations show outstanding results, excellent quality of fit, and equivalent kinetics results. Second, a tougher trial – interaction between a protein and its low-molecular weight compound ligand. The interaction between Carbonic Anhydrase II and its inhibitor, 4-CBS, was analysed on both the Reichert4SPR and the Biacore T200. Once again we see that both are giving excellent results, excellent fitting, good kinetic data, and high sensitivity. Given that both provide equal performance, how do you decide which to choose? Value for money. The Reichert4SPR is excellent value for money when compared to competitors such as the Biacore T200, with savings of up to 30%. This is due to the incredible robustness of the fluidic system, the open, modular system, and the plethora of reasonably priced consumables available from XanTec. By minimising consumable and maintenance costs, as well as providing you with top-flight technical support, XanTec ensures that you maximise the value of your purchase. Interested? Want to learn more about XanTec's SPR catalogue, including the latest systems from Reichert Technologies? Contact us today! Download a comprehensive PDF flyer on the 4SPR.